"The Yama Yama Man" was a comical song for the Broadway show The Three Twins, published in 1908 by M. Witmark & Sons with music by Karl Hoschna and lyrics by Collin Davis. 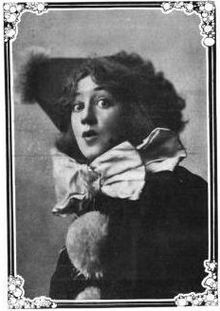 It became popular after Bessie McCoy's animated performance in a satin Pierrot clown costume with floppy gloves and a cone hat. At age 20, she became an overnight sensation on Broadway and was known thereafter as the "Yama Yama Girl"; it became her lifelong theme song, the show ran for 288 performances. The lyrics contain topical references of the era such as street cars and ladies' fashion while the refrain is about a comical bogeyman—the Yama Yama Man—who is "ready to spring out at you unaware". Bessie McCoy's song and dance routine was a standard into the 1930s with a prestigious lineage of imitators including Ada Jones, Marilyn Miller, Irene Castle and Ginger Rogers. The Yama Yama Man by Ada Jones and Chorus (1908)). Ginger Rogers performing Yama Yama Man from the film The Story of Vernon and Irene Castle (1939). she swings on her heel and leaps away into a wild fantastic headlong dance—the dance of a crazy king's clown, half girl, half wild boy, heady with the wine of the Spring air at twilight … The black satin of her bloomers fills like sails, and they ripple and flatten against her body. Her hair flies in loose flax around her face, and her face is a vivid white candle flame in the yellow aureole of her hair … Her feet might be bounding white balls carrying her body with them in their tireless, leaping flight. She circles madly around the boards, touching lightly and rebounding from the jutting points of the painted mock scenery, like an imprisoned moth, or an elf hunting for some lost thing and fearful of being caught. She is wonderful. Bessie McCoy in her Yama Yama Man costume. The July 25, 1908, edition of Billboard magazine reported the following story how the Yama song originated. When The Three Twins was rehearsing in Chicago, prior to first opening, Karl Hoschna, the composer, was asked to furnish a "pajama man song". He wrote one called The Pajama Man only to learn that it could not be used owing to another pajama number booked at the Whitney Opera House the next day. Gus Sohlke, the stage director, happened to pass a toy store and saw in the window a doll built out of triangles. Realizing that this had never been used in stage work he decided to have a triangular man chorus in place of The Pajama Man. That afternoon as he, Collin Davis and Hoschna sat together wondering what they would call the song, Sohlke kept repeating Pajama jama yama yama. Suddenly he brightened up and cried "Did either of you fellows ever hear of a Yama Yama Man?" Of course neither one had and Sohlke confirmed "Neither have I! Lets call the new song Yama Yama Man". Quickly Davis set to work to write a lyric around the title and that night Sohlke and Hoschna locked themselves in a room with Bessie McCoy and rehearsed the Yama song and dance for five hours. 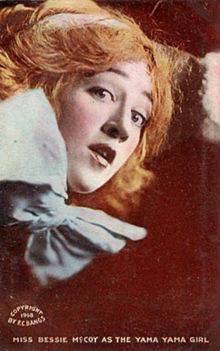 Ada Jones recorded "Yama Yama Man" in 1909 for Victor Light Opera Company. The lyrics for verse two and three were changed, verse two being more bawdy. It spent five weeks at #1 in 1909 and was the most popular song of her career. Stanley Kirkby recorded a version around 1912 accompanied by banjo. In 1909, the Cuban dance orchestra Orquesta De Enrique Pena recorded a version in a traditional Cuban style. In 1909, the young dancer Irene Foote began imitating Bessie McCoy's "Yama Yama Man" in amateur theatricals. Irene's mother would take her around to Broadway producers auditioning her talent using the Yama routine, but with little success. Irene later had a successful career in modern dance with her husband Vernon Castle and in 1939 Ginger Rogers played Irene in the biographical film The Story of Vernon and Irene Castle, in which Rogers re-enacts Irene imitating Bessie McCoy's "Yama Yama Man" routine during an audition (see film clip). In Warner's Look For The Silver Lining (1949), June Haver plays Marilyn Miller imitating Ginger Rogers imitating Irene Foote imitating Bessie McCoy's performance. The song led to a spin-off children's novel Yama Yama Land (1909) by Grace Duffie Boylan. Francis Scott Fitzgerald briefly mentioned it in The Beautiful and Damned (1922). In 1967, actor George Segal released an LP titled "The Yama Yama Man", the title track is a ragtime version with horns and banjos. Segal apparently released the album due to his popularity doing same on The Tonight Show Starring Johnny Carson". In 1989, the Madison, Wisconsin punk band Tar Babies released a song "Yama Yama Man" on their album Honey Bubble but it has no connection musically or lyrically with the original, in name only. The song continued to find an audience into the 21st century with a jazzy cover by Californian group The High Sierra Jazz Band that includes animated singing that is mostly faithful to the original lyrics and spirit of the song. The song was released on their album "We Got'Em". In 1918, the cartoonist Max Fleischer created Koko the Clown, who appears to owe much to the Yama Yama Girl costume. Both Koko and Bessie McCoy wore clothing of loose black material, with three large white pom-poms in front and a white-trimmed neck frill. Both wore white foot coverings, white gloves with long fingers, and a hat with the same white pom-pom as in front. A 1922 sheet music drawing makes the connection explicit, saying "Out of the Inkwell, the New Yama Yama Clown", showing a picture of Koko. Is afraid of the dark you know. When off to bed they go. Terrible eyes and a face of tan. Ready to spring out at you unaware. For here comes the Yama Yama man. So you cover up your head. Standing right beside your bed. Ev'ry girl takes off her hat. For you can't see 'round her rat. Thinks he'll have to change his dish. For he's getting sick of "Fish". Holds her skirt up with hands so deft. And she also has a darn good left. Is the brightest scheme evolved. So the traction question's solved. Verse 1 & 2: About the subject of the song. These are the only two verses sung in the play; the remaining four verses were reserved for McCoy's inevitable encores. Verse 3: Ladies fashion of the period involved elaborate hats arranged with stuffed birds, feathers, flowers and so on. Bouffant hairstyles, popular at the time, were sometimes made with "hair-rats", which were pads of old hair taken from brushes stuffed into the hairdo to create volume. They were a "dismaying sight to find in the theater seat directly ahead." Verse 4: The railroad tycoon Edward H. Harriman ("The Colossus of Roads") had a very public war of succession with Stuyvesant Fish over the Illinois Central Railroad around 1906. Verse 5: Right and left ankle or leg. Turn of the century skirts were normally very long and when women lifted their skirts in the street to prevent them from getting dirty, men might catch a glimpse of an ankle or leg underneath. As the 20th century progressed hemlines became progressively shorter. It is quite some time since the trial and approval of the "pay-as-you-enter cars," and I fail to see why they have not been introduced on the Broadway line. A strong public sentiment favors these new and up-to-date cars, since they not only gather in the nickels, but they do away with crowding, shoving, jamming, and the abominable nuisance of the conductor, who used to throw people down and step over them in his eagerness to gather the coin that he paid over, or did not pay over, to the car companies. In 1909, the Pay-As-You-Enter Car Corp issued stock making it quite topical around the time of the song. ^ "Collin Davis" was the pen name used by George Collins Davis (1867–1929), a lawyer who later helped frame the Fordney–McCumber Tariff law, for his lyrics for musical shows. ^ Langford, Gerald (1961). The Richard Harding Davis Years. New York: Holt, Rinehart And Winston. p. 263. But they don't care for the plot. Are wearing much or not. But the man he must have lied. The poor little bugs all died. ^ a b "The Yama Yama Man". Netlex News. July 5, 2006. Archived from the original on April 26, 2012. ^ "The Yama Yama Man" Sung by Stanley Kirkby & Banjo C 1913 on YouTube, Uploaded by EMGColonel on Nov 20, 2011. Accessed April 2012. ^ Orquesta De Enrique Pena (1909). "The Yama Yama Man". Retrieved March 30, 2017. ^ a b Iris Fanger, "Castle" in Notable American women: the modern period : a biographical dictionary, Volume 4, editors Barbara Sicherman, Carol Hurd Green, Harvard University Press, 1980. See p. 142. ^ Video of Ginger Rogers performing Yama Yama Man, from the film The Story of Vernon and Irene Castle (1939), hosted at Turner Classic Movies. Archived version at Internet Archive. ^ Arlene Croce. The Fred Astaire & Ginger Rogers book, Vintage Books, 1977. p. 156. ^ Clifford Terry (April 2, 1993). "Banjo Pickin' With George Segal". Chicago Tribune. Archived from the original on August 12, 2012. Retrieved May 10, 2012. ^ Tar Babies - Yama Yama Man on YouTube. Uploaded by renegademonks on Apr 13, 2011. Accessed May 27, 2012. ^ Yama Yama Man at AllMusic.com. Accessed May 27, 2012. ^ High Sierra Jazz Band "Yama Yama Man" on YouTube. Uploaded by SFRaeAnn on Jun 30, 2010. Accessed May 27, 2012. ^ Recordings, The High Sierra Jazz Band official website. Accessed May 27, 2012. ^ "Hair Rats", Pin Girl. ^ Carl Snyder, "Harriman: Colossus of Roads", in The American Monthly Review of Reviews, January 1907, Volume 35. p. 37. ^ The New York Times: Louis M. Fisher. New York, April 26, 1909. Wikimedia Commons has media related to The Yama Yama Man. Video of Ginger Rogers performing Yama Yama Man, from the film The Story of Vernon and Irene Castle (1939), hosted at Turner Classic Movies. Archived version at Internet Archive. "Cuddle up a Little Closer, Lovey Mine"
"I've Got Rings On My Fingers"
"Has Anybody Here Seen Kelly?" "Come, Josephine, in My Flying Machine"
"Be My Little Baby Bumble Bee"
"What Do You Want to Make Those Eyes at Me For?"